Just as 2009 was a tale of a weak economy accompanied by a strong stock market, we forecast that next year will reverse the situation with strong economic news accompanied by a weak stock market. A lesson that I was well aware of has been reinforced in the minds of market participants yet again and this time indelibly. After a very large decline, the market was poised to recover sharply with the assistance of rocket fuel provided by the Fed. 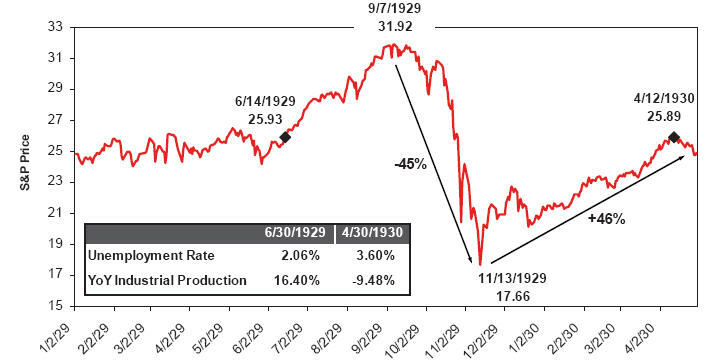 A review of the 1929 crash showed a last hurrah when after the sharp decline in the fall of 1929, the S&P 500 rallied 46% from its low in November to the rally high of April 12, 1930. It then, of course, fell by over 80%. History’s greatest stimulus program, desperate bailouts, and clear promises of years of low rates and an ocean of liquidity ensured that this cycle's rally was going to be the best ever. Looking at previous rallies following deep corrections, this market followed the same playbook. Lesson: Don't Fight the Fed, yet again. Some things never change. severe problems down the road. So, we anticipate that the markets will continue to be a minefield for many years going forward, confounding investors and destroying wealth of those that are unwary. Good reasons to consider competent long / short wealth managers. As we move forward, we expect to see economic green shoots of some variety and corresponding good to decent economic news. Inventories will recover, capacity utilization will bounce back and we are already seeing signs of rising real estate prices. It is our opinion though that this is a headfake, the mother of all headfakes. lives to being less capital-rich, this market and economy will not be healthy and this could be a period similar to the mid 70s or late 30s. The other scenario that comes to mind is Japan as we have followed a resolution model that closely mimics theirs with a leverage factor many times greater. Finally, China looks to be an economic ponzi scheme perpetuated by the government. More later. To put it briefly, I am decidedly bearish going forward and am looking for a major correction in the coming months, one that will take us past 800 on the downside at the minimum.